Trust Barrister’s team of seasoned professionals and our cutting-edge technologies to provide you with comprehensive, cost-effective digital printing solutions to meet your every need. We offer 24/7 365 availability and FREE same day delivery. Email your project to [email protected], or simply fill out our project form below and someone from our staff will be in touch with you. Upload your PDF or Powerpoint to our site and have your prints delivered right to your office. You can choose from either full color printing, or black and white printing and choose from a variety of different paper selections. Printing can be done double or single sided and bound with a variety of options. Choose Wire or Coil Binding for premium looking, easy to read presentations. Or, choose a more economical type, such as comb binding. Three ring binders of all sizes are also available. All of these presentation binding options lay flat as you flip through the pages. Tape Binding and Velo Binding are also available, as well as saddle stitch for a more of a flat look. Choose Custom Tabs for an excellent way to make your presentation easy to flip through, and really stand out. One of the most underrated stages of proposals is printing, binding, assembly and packaging. With Barrister Digital Solutions, you can have your proposals delivered at literally any time of the day. We work with precision to quickly turn around and deliver hard copy proposal proofs so you can be absolutely sure it is perfect. We offer a wide variety of paper and binding options to make your proposal look it’s best. Choose from wire, coil, velo, three ring binders and more. Odd sizes for international proposals are also available – and Custom Tabs are easily created at the drop of a hat. Choose from premium smooth bright white letterhead, or premium white linen letterhead to highlight your business for a lasting impression. Printing custom letterhead can take a normal business letter from boring to eye-catching. All letterheads are compatible with inkjet and laser printers. Custom letterhead can make customers feel at ease doing by business with a seemingly reputable company. Image is everything! Our program printing starts with programs of all sizes – from an 8-page saddle stitched booklet to a much larger perfect bound book. Programs are printed in full color, with premium paper options – 100# Gloss/Matte Text and 100# Gloss/Matte Cover to name a few. Whether it’s restaurant menus, event materials, posters, price sheets and more – we’ve got you covered. Laminating is available in glossy, matte, or satin, with flush cut finishes, sealed edges, round corners, and even one sided lamination. Protect your documents with a variety of options, thicknesses, and finishes to serve all your lamination needs. We offer a wide variety of binding options. Saddle Stitch, Coil, Wire, Tape, Velo, Comb, Perfect, 3-ring and more. ● Saddle Stitch – A Saddle Stitched booklet is where the pages and cover are folded in half. The folded sheets would be nested one inside the other and then stapled together along the folded crease or spine. ● Coil Binding – Coil binding, also called Spiral Binding, joins the pages and cover of a book using a durable plastic or metal coil that is shaped like a long spring. ● Wire Binding – Wire Binding is the arguably the most professional appearance for book binding and is also referred to as twin loop wire, and wire-o. ● Tape Binding – Tape bound books are a cost-effective alternative to perfect bound books. In this type of binding, a strip of tape with glue adheres all of the pages together. ● Velo Binding – Velo Binding, also called Strip Binding, is a binding option normally used for single use publications and prints that need to be stored for regulation purposes. ● Comb Binding – Plastic comb binding is one of the most popular binding methods. It is commonly referred to as GBC Binding, and is used in cookbooks, reports, and training manuals. ● Perfect Binding – Perfect binding is commonly used for catalogs, directories and paperback books with a higher page count. ● 3-Ring Binding – A 3 ring binder provides just the professionalism and flexibility you need for proposals, meetings, seminars, employee handbooks, technical manuals and more! Marketing postcards are an inexpensive and effective way to reach your audience. From promotions to parties, postcard printing is versatile and functional for personal and professional needs alike. Street marketing handouts, wedding invitations or holiday greeting cards, postcard designs can be easily customized for business and special occasions. Promote your business and events with custom brochure and flyer printing. Premium quality paper, and full color printing help to convey your business message clearly. Gloss, Matte or UV Coated finishes are available, as well as multiple folding options. Print high-quality, large format full color posters for your presentation, store display, research poster or, scientific poster presentation. Customized tabs help employees and clients quickly sort through information and turn your presentation, manual, or publication into an easy to use reference source. Manual printing services has a wide variety of options. You can choose from many different paper types, a wide variety of binding options including wire, coil, comb, tape, velo, 3-ring, etc., and even add custom tabs to make your manual even easier to reference. Foam board is an attractive, reasonably priced and versatile material for displaying images. Lightweight and long lasting when displayed indoors, foam core is the most economical and cost-effective choice for indoor poster displays. Foam core mounted signs are perfect for table top displays at trade shows, accompanying an important presentation, assisting a training class, as an exhibit board for mediation, arbitration or trial and so much more. Displaying a large banner is one of the most noticeable forms of advertising, and another high impact, low cost strategy for promoting your business both indoor and outdoor. We use scrim vinyl banner material, with the option to add grommets. 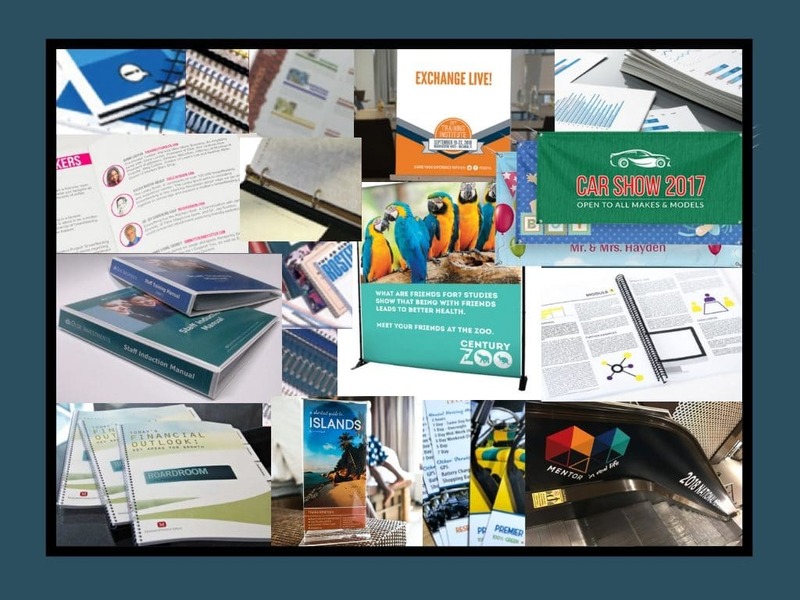 We offer a huge assortment of elegant and versatile banner stands and floor displays perfect for on the go marketers, step and repeat photo walls, exhibitors, trade shows, networking, recruiting fairs, community events and more. Easily promote upcoming events and promotions with yard signs and flags. Draw attention to your brand easily and effectively with hard to miss sail signs that flutter in the wind, or custom event tents to stand out from your competition. Flags are the perfect way to draw attention to your promotion or business and can be displayed indoors or outdoors. Whether it’s a column at an event, a high impact floor graphic to show off a paid sponsorship, or even a wall graphic to put your brand on display, Barrister Digital Solutions has it all under control. We can easily assist in measurement, surface testing, and even installation and removal.